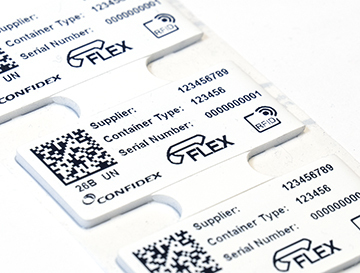 Confidex Flex UHF RFID Labels connect the high-value components automatically to electronic data interface (EDI). This makes component tracking error-free and gives real-time data about the inventories. By that way Tier 1 part suppliers, OEM’s, and logistics providers can further optimize the inventory levels and gain resource savings. These labels are designed to match with wide variety of components – whether the component is plastic, metal, flat or curved. Their flexible structure and strong background adhesive provides a durable identification method for components ranging from car batteries to plastic parts. Reliable identification of high-value assets. Personalized with VDA-compatible data, ready for EDI. Flexible, IP 68 rated UHF RFID label optimized for metallic surfaces. Label can be attached on a curved surface with smallest diameter of 50mm. Excellent adhesion to all surfaces including low surface energy plastics and painted metal.